Over the past three years several pastors and congregations have expressed interest in my use of the Narrative Lectionary. This post gives some background on reasons for using, and the challenges and delights of using it. My life has been lived with the liturgy and the lectionaries (systems of Bible readings selected for each Sunday in the year). Growing up in the 1950s and 1960s I worshiped in a church that used The Lutheran Hymnal (TLH, 1941) and the one year lectionary. The 1970s were a time of transition (I was in the Navy). By 1982 when I began seminary and began preaching every third weekend, I was introduced to Lutheran Worship (LW, 1982) and the three year lectionary. That has been my worship life—until 2012. It was in January of that year that my lectionary life changed. I began serving my current congregation (in southern California) in August 2011. It didn’t take long to discover that this area was not the typical Midwest, church-life saturated community. The unchurched rate of the area is about 98%, and many who were coming into the church had little to no background in the Bible and Bible history. Granted, the Gospel readings are in sequence for Mark’s Gospel during that time frame. But if preaching on the Old Testament during that season, then the out-of-order sequence becomes not only noticeable but confusing. 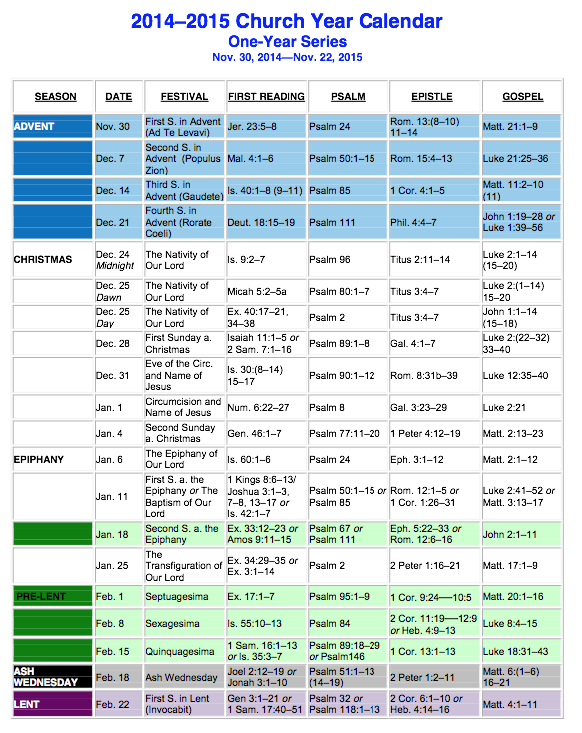 And throughout the year, the Gospel readings are not consistent in terms of sequence. I considered alternative lectionaries such as: the Eisenach Selections, the Thomasius Selections, the Synodical Conference Selections (1912), and the Soll Selections. (Sermon Texts. Ernst Wendland, Editor. (Milwaukee: Northwestern Publishing House, 1984) The Soll Selections is unique in that it offers two Gospel readings for each Sunday. Each of these offer variations of the standard lectionaries, and each might be worth examining for lectionary use. But they still have the same problem with out-of-sequence readings particularly in the Old Testament. The NL seemed to be a possible answer to the dilemma I noted in the other lectionaries. So why the Narrative Lectionary? The short answer is simply: Because knowledge of the biblical story is crucial to a maturing Christian faith. But most Christian preaching assumes that worshipers already know the basic biblical story—and thus most Christian preaching does not seek to equip people to know the biblical story. The NL seeks to be one part of an approach that seeks to equip people to know God’s story—to discover God’s story and to find in that story the love of God in Christ for all, especially the reader/hearer. A lectionary is a set of readings from the Bible for each Sunday of the church year. Lectionaries have been used since the time of the early church. Most, if not all, Lutheran congregations have been using either the one year lectionary or a three year lectionary. These lectionaries cover quite a bit of the Bible. However, most, if not all lectionaries used over the past 1600 years assumed a church and Bible knowledge. What happens if most people coming into the church have no such background? The NL is an experiment to help congregations with that very question. The NL is a four year series of Scripture readings for Christian worship, which moves through the overarching biblical story in a nine-month period. The series starts in September and ends in May. The summer allows a variety of topical preaching, or even sections of the readings not covered during the year. At the same time, the narrative lectionary respects the traditional Christian church year, with its principal festivals and seasons — Advent, Christmas, Lent, Easter, and Pentecost. Fall: NL moves chronologically through the Old Testament story—beginning in Genesis around the start of September and culminating with the promise of the Messiah during December (Advent). Winter: NL moves in order through one Gospel—tracing the story of Jesus in canonical order from birth, through ministry, passion, and culminating with the story of the resurrection at Easter. There are four years to the cycle, so NL covers all four Gospels. Thus, year 4 focuses on the Gospel According to John. In other lectionaries, John is relegated to a few readings to fill in gaps in Mark. Spring: NL engages part of the story of the early church, as told in Acts and other New Testament writings. Summer: This is not provided by the developers of the Narrative Lectionary. So pastors have some options. One summer I preached on additional texts in the Gospel for that year. Another summer I preached on two short New Testament books. What makes the Narrative Lectionary different? This lectionary is not simply a series of stories; rather, it is a series of stories that provide an understanding of and appreciation for the broader biblical story. The NL differs from other lectionaries in several ways. Thus, the Creation theme is explored in four ways. Week 2 focuses on Abraham, Week 3 on Jacob and Joseph, etc. 2. By the very nature of NL, the primary focus is on narrative passages. The exceptions would be prophetic writings toward the end of the Old Testament segment. 3. The NL focuses on one reading each week. While only one reading is provided, we have three readings plus a Psalm (see below, Filling the Gaps), but the main reading and sermon will focus on that pivotal text provided in the basic structure NL. 4. Because the NL is shaped this way, one concern had been the church calendar. Thankfully the basic church calendar is not abandoned — the birth of Christ Jesus is still celebrated at Christmas, the resurrection of Christ is still celebrated at Easter. The time of Advent is kept by focusing on the promise of the Messiah. Appropriate readings have been chosen for church commemorations, such as Reformation, All Saints, Ash Wednesday, and Holy Week. As I began seriously exploring the Narrative Lectionary, I noticed some gaps in what was provided on the web site. Is one reading sufficient for a liturgical, lectionary program? I didn’t think so. Likewise, there was no support work that would complement the liturgical text. Thus, about six months prior to beginning the NL, I spent time filling those gaps. I have done that for every Sunday since September 9, 2012. I usually plan these at least six months ahead. For instance, I completed the post-Easter readings through the end of August about February 1. So I have years 3 and 4 completed. As we begin year 1 in the fall of 2014, I have already prepared several of those additional readings. Is it a lot of work? Yes. But there is an added benefit to me as pastor. I find that it helps me in long term planning, as well as preparation for each Sunday. Even more, I knew the full set of texts so well, because I had read every reading several times to make sure they fit together for each Sunday. On occasion as part of my sermon preparation I have added or changed a reading in the week or two prior to the actual reading. I should note that the Narrative Lectionary website now offers Prayers of the Day to match the NL. However, when I began I did not find any of the prayers. Therefore, because the Sunday themes in NL did not match the one year or three year series, I began writing a Prayer of the Day for each Sunday to match that specific theme. That was a challenge for me, but I plunged ahead. Early in the process of preparing for introduction of the LN, Pastor Hank Simon (LCMS) contacted me about using the NL. In the conversation, we agreed that I would supply him with the additional readings, and we would share writing the Prayer of the Day for each. What a blessing he has been in this specific phase of NL implementation. My prayer writing (and prayer life) has been enriched because of his thoughtful, clear, appropriate prayers. Our congregation has been blessed by his work as well. In our congregation we have one person who has been a prayer partner. This last fall I asked the person to consider helping me write some of the prayers. The person agreed and has written one quarter’s worth of prayers. I proof-read each prayer, making suggestions, but leaving the general thrust of the prayer in place. This has been of great benefit to me, the congregation, and this person. As we finish the full four year cycle in in the spring of 2016 (we started with year 3), we may revise some of the early prayers. In that case, we now have three other individuals in the congregation who have demonstrated a deep prayer life and who love to write. My goal would be to incorporate them into the reviews and rewritings of the prayers. Serving as a pastor over the years I have been aware of the importance of preparing a congregation for any change in worship. Depending on the changes, it might take a few weeks or a few months to prepare. In the case of the NL, I looked at six months as the time necessary to implement the transition to using NL. The first step of preparation was to go to the Elders and then the Church Council and explain the use of lectionaries, and the most common lectionaries in use (three year and one year). In these two meetings I helped the leaders realize the gaps in our peoples’ knowledge of the overall Biblical history, and then the difficulties of the reading sequences in the three year and one year lectionaries filling that gap. The entire leadership, Elders and Council, were 100% committed to moving toward using the Narrative Lectionary. It was at this same time I began preparing the additional texts to be included each week. In the three months prior to beginning the NL I would include a bulletin insert that explained the purpose of the NL and its application in our congregation. At regular intervals during the summer I announced the NL that would begin the Sunday after Labor Day. During the last month we included a bulletin insert with the Fall themes for each Sunday. The first Sunday I introduced the topics by means of a timeline (on Powerpoint). Each week I added a new theme. That way the worshipers had a reference to previous weeks’ themes. Again the purpose was to give that unfolding salvation history according to a basic timeline. This visual orientation was more critical in the Old Testament segment, given the vast time periods covered and the multiple Old Testaments books used. In the Gospel segment (Christmas to Easter), each week’s reading came from the Gospel, strictly in canonical order, although not every passage of every Gospel was covered. 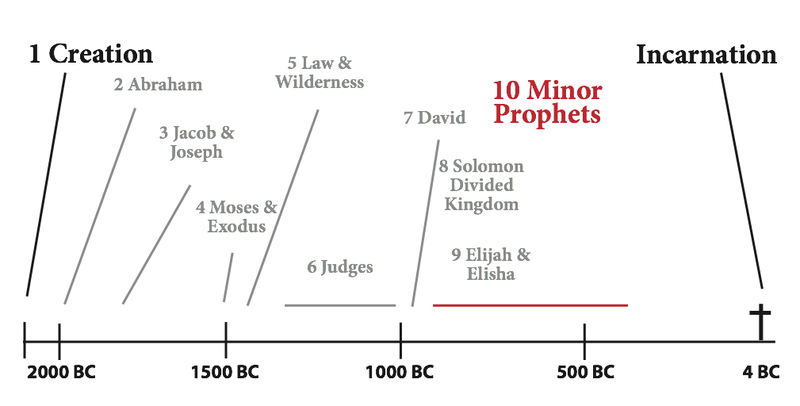 If the Epistles were used as the primary teaching, then a simple New Testament timeline could be used. As I considered using the Narrative Lectionary, I realized that it could only be part of the solution to providing a Biblical framework for understanding the texts. Back in 1989 I was one of the 70 pastors who introduced LifeLight into the LCMS. About the same time I was developing similar Bible studies for my own congregations. By 1991 I had completed development of an 11 week Old Testament Survey class and an 11 week New Testament Survey class. I have taught these in several congregations over the years. So I decided to use these study guides to complement the NL. 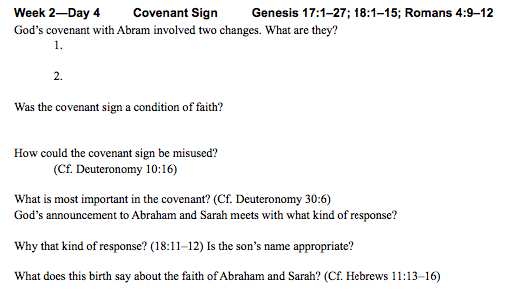 The same week we began using the NL, we began the Old Testament Survey class. I taught it on Wednesday and Thursday evenings and Saturday morning. Although I had not checked how the Survey course would match the NL readings, as it turned out, the sequence fit very well together. Although the Survey course finished the week before Thanksgiving, it was a blessing for all who participated. The combination of the Survey and NL gave the needed historical and canonical framework for better understanding. After Christmas I began two sessions of the New Testament Survey. The correlation with NL wasn’t as tight as the Old Testament because the Survey covered all the New Testament, whereas the NL covered only the Gospel According to Luke. Nevertheless, the Survey was useful for all participants. I plan to offer the two survey classes about every third or fourth year. This will catch up new people in the congregation and provide a useful review for those who have taken the courses in prior years. After 3 ½ years of using the NL, my overall assessment is that it is well worth exploring for any pastor or congregation. For congregations, I definitely think it offers people new to the Christian faith a good framework for following the Biblical story; this is particularly important in the fall season with 16 weeks with the Old Testament themes. And for those who have been Christian for years, this is either a good review for them, or even the first time they have been able to follow the Biblical narrative. For preaching purposes, I especially liked the opportunity to preach through John’s Gospel. The one year and three year series offer relatively few pericopes from John. Because most of John’s Gospel is “new” for preaching, it allowed me to explore the Gospel in a refreshing way. In the Synoptic Gospels the introductions tied together the historical sequences leading up to the current text. But for John’s Gospel my introductions each week focused more on relating the thematic structure of the Gospel to the current pericope. To me, the use of four readings (OT, Psalm, Epistle, and Gospel) in a liturgical service is strongly recommended. I was disappointed that NL did not really offer anything for that aside from one or two verses in the Gospels to correspond to the Old Testament readings. My initial thought was I can choose additional readings as I go forward. That sounded nice at the beginning, but once I got into the use of NL, at times I was a little overwhelmed (timewise, as I have another position besides pastor) with choosing additional readings. I should note, too, that because of the length of a few readings, I have on occasion omitted either the Old Testament (non-fall period) or the Epistle reading. This happens only about once or twice in a quarter’s worth of pericopes. Over the past 25 years I have always worked out a grid for planning sermons at least three months ahead. This is even more crucial for the NL. So, it is now April and I am beginning to add readings for the Fall season, Year 1. At the same time, I have benefited from this detail work of finding readings. Once I finish Years 1 and 2 I will have four readings for all four years of the NL. That will make the next cycle easier for planning and preparation. So also with the Prayers of the Day. One thing that I will pursue in the coming years is to perhaps reach out to other pastors who use NL. I would like to connect with them, perhaps meeting once a month for an exegetical and homiletical exchange and discussion. Since I teach seminary classes using live video, that might be an appropriate venue. The closest Lutheran church is about 50 miles away, so face-to-face meetings would not be practical. But I do think this would benefit me as well as the other pastors. In summary I find the switch to and the use of Narrative Lectionary to be a very positive benefit to me and to the congregation. At the same time, I have gained an even greater appreciation for the historic one-year lectionary and for the three-year lectionary. As for the future, I am looking at what to do this summer. Do we continue the Narrative Lectionary? Or do we use the one year lectionary or the three year lectionary? I will decide by Easter 2016.